GUATEMALA CITY (CNS) — In Guatemala City’s colonias, the settlements where factory and construction workers make up most of the population, Sister Sarah Mulligan runs a one-stop shop for services many locals otherwise can’t afford. Clinica Daniel Comboni is a colorful two-story building in Villa Victoria that offers medical and social services to anyone who wants them. Here, dental services cost roughly a fifth of what they typically run outside the clinic. Women can take courses geared toward self-empowerment, and children are offered supplementary education and nutrition. Sister Mulligan, a Sister of Charity of Cincinnati who arrived in Guatemala 20 years ago, said of the clinic’s 45,000 registered patients, she has a particular fondness for one woman: an illiterate mother with an alcoholic husband who sends her five children to the clinic, without fail, for all their courses. In 1993, Sister Mulligan, a nurse, read in the Cincinnati Archdiocese’s monthly newspaper about Comboni Father Bill Jansen, a fellow Ohioan who was assigned to a parish in Villa Victoria. While fundraising to expand his chapel into a church, he learned from locals that they especially needed a clinic, so he secured the funds for both. Thinking her clinical experience might be helpful to his mission, Sister Mulligan reached out to Father Jansen. He invited her to join him in Guatemala, where they finished construction plans a couple of years after her arrival, and Clinica Daniel Comboni opened in 1998. “I came for a few years to help it get started,” Sister Mulligan said. “And here I am still today,” celebrating the clinic’s 20th anniversary. When she moved to Villa Victoria, there were no public health services in the area, she said. Today, the clinic has three doctors, two nurses and 27 employees. For $3 per visit, locals can see a doctor; grants, donations and raffles the clinic hosts cover the remaining costs. The quality of care is so high and consistent that people of all income levels are drawn to the clinic. One of the first social programs to emerge at Clinica Daniel Comboni was a 1999 women’s empowerment program, which snowballed into more programs, including educational programs, skills development classes and regular talks on self-esteem, domestic abuse and women’s rights. Vicki Orrego, who works with children at the clinic, said young married women who attend the talks often react as though they should not hear information on those topics. Some husbands do not allow their wives to go back. Another approach toward empowering local women is through the family support program, created “to motivate moms, educate them and help generate changes within their family that will then change the community,” said Hernandez, who helps run that program. One group helps senior citizens who live alone or are frail or ill.
“It’s the most joyous group, the most participatory, the most punctual, the most collaborative, the most persistent, the kindest,” Hernandez said. Some meetings for the senior citizens revolve around physical health awareness, with eye exams and measuring blood pressure; others are more focused on activities, such as learning to embroider. The group also takes a field trip once a year — this year, the seniors went to a railway museum — and they leave with a bag of supplements after every meeting, too. The clinic is one of the few places in Guatemala that provides a soy- or corn-based porridge that contains 21 vitamins and minerals. 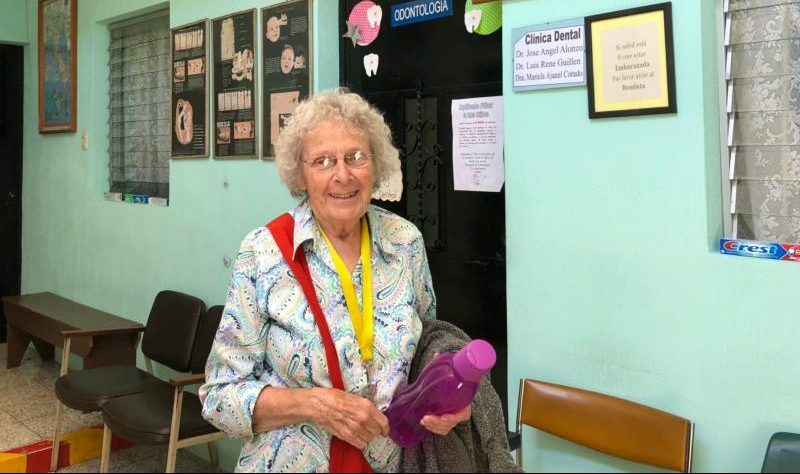 Passionist Sister Felipa Gomez oversees this program, which provides the supplemental nutrition to up to 200 children, ages 6 months to 6 years, who are underweight or malnourished. “Today, I registered a 2-year-old who looks younger than 1; he’s anemic and malnourished, and if through this work, that kid gets stronger and healthier, that’s where I see the Holy Spirit,” said Sister Gomez, who first offered to help Sister Mulligan at the clinic in 2010. Beyond addressing children’s nutritional needs, the clinic conducts socioeconomic studies and house visits to assess what a family’s general needs are, Sister Gomez said. She recalled Sister Mulligan saying, “What good is giving them monthly donations if they can’t read?” which kicked off book drives and the sponsoring of school supplies. The clinic also offers smaller daily services, like driving kids to their extracurricular activities if parents cannot afford transportation. In exchange for the help, parents agree to participate in one of the clinic’s programs, such as recycling, “so they can value what they’ve been given,” Sister Mulligan said. But the help isn’t always met halfway, she added. She recalled a mother with four kids, the oldest with special needs. The mother kept signing them up for courses and pulling them out shortly after, despite Sister Mulligan’s recommendation to keep them in school. Salgado is a staff writer for Global Sisters Report.